I began to watch a new anime that aired this past January called Yatterman Night (Yoru no Yatterman) which celebrates 40 years of Tatsunoko's Time Bokan series, in particular Yatterman, the second and most popular of the franchise, which had a 2008 remake and the 2009 Live Action movie. A mysterious stone known as Skull Stone (ドクロストーン Dokurosutōn?) is scattered across the planet, and it holds the power to reveal the location of the largest deposit of gold in the world. The "Doronbo (ドロンボー Doronbō?) Gang, the three villains, are searching for the Skull Stone. Standing in their way are Gan and Ai who, teamed up with their large mechanical dog Yatterwan, become the masked heroes Yatterman-1 and Yatterman-2. Unlike the previous series in the Time Bokan lineup, Yatterman does not cover any specific time/space travel. Instead, the places the characters travel to and the individuals they meet are either a homage or parody. The fictional characters or places are usually represented by purposely misspelled names or familiar actions. 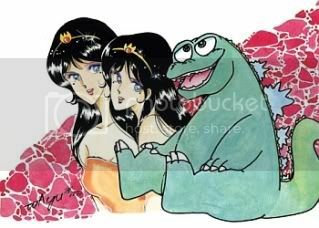 For example, a revolution leader is named "Yashington" as a homage to George Washington; and a place resembling ancient Japan is named "Yametai" ((I) want to stop), as a spoof of Yamatai. 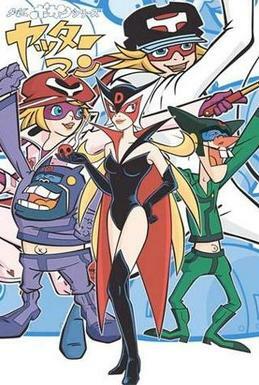 Of course,and as the picture above shows, the real stars of the series were the Doronbo Gang, which popularity pretty much were the basis of lateer anime serie that included a trio of goofy bad guys (Pokemon's Team Rocket being one of many), thogh it was Time Bokan who introduced the concept, Yatterman cemented it. Well, Yatterman Night is basically the story of the Doronbo Gang's descendents which will fight the Yatter Kingdom, now a despotic police state-like place. I really recomend this show, they basically took the idea of making the bad guys into good guys and viceversa, but with their descendants and give the show a more darker feel, but not without loosing the goofy moments the original show had. "There are 4 things that I've learned to dont discuss, because they end with people killing each other: Religion, politics, sports, and logic on anime and kaiju movies"
Will Yatterman in all its forms come to America in dubbed or altered version? As a huge fan of another Tatsunoko production (Gatchaman) , I became familiar with Yatterman through the video game Tatsunoko vs Capcom for the Wii, of which there are characters for Yatterman & Yatterman II (special unlockable character) as well as Doronjo . I would not mind watching this show if it became available in the United States. I will check the one you linked to on Youtube however.